Part of an E3 ubiquitin ligase complex for neddylation. Required for neddylation of cullin components of E3 cullin-RING ubiquitin ligase complexes by enhancing the rate of cullins neddylation. Functions to recruit the NEDD8-charged E2 enzyme to the cullin component. Involved in the release of inhibitory effets of CAND1 on cullin-RING ligase E3 complex assembly and activity. Acts also as an oncogene facilitating malignant transformation and carcinogenic progression. 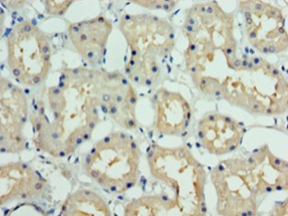 DCUN1D1 Polyclonal Antibody. Unconjugated. Raised in: Rabbit.